What makes Nutria such a nuisance is their living and eating habits. Since Nutria are an invasive species, they do not live in balance with the natural resources that are available and will eat more than they actually need. This creates an issue with gardeners and farmers as Nutria will often eat a large majority if not all of the food that is available to them. The will also eat any vegetation that looks nice in your yard which is an issue for people who care about what their yard looks like. Nutria will also cause problems with the water flow or the stability in the area where they build their homes. They can damage dams and collapse the sides of water banks which is damaging and costly. Here are some do it yourself tips to get rid of the Nutria living near or on your property. A very effective way to get rid of Nutria is to trap them. However, this takes a lot of time and patience, especially if the population is out of control. Check with your local wildlife and game agency to make sure that it is even legal to trap the animal in your state. Because Nutria are an invasive species it is usually recommended that you dispose of them once you catch them. You can buy traps that are double door traps or leg hold traps that work well for Nutria. You can find these in most garden stores or online and you will set these up near the Nutria’s high traffic areas with the hope of catching them. Many people try to poison Nutria that they have a problem with, but you absolutely should not do this. Poison is easy to misjudge and dangerous to use as other innocent animals or your own pets can get a hold of it and eat it. Poison can also be counter-productive because the animal can go to a hard to reach place to die which will cause a stench and even poison the water supply. If the majority of your problems come from the Nutria eating your gardens and crops you can build a sturdy fence around it to keep the Nutria out. Any fence will do and you can put it just around the areas that you do not want them to get into to save on time and money. There are repellent sprays and faux predator urines that are available on the market, but they rarely work and you waste more money than anything. Repellents are definitely not ideal if you live in a place that rains a lot as you will have to re-spray the area each time it rains. However, there is a type of repellent that works really well. Release the natural predators of Nutria into your yard to keep the Nutria away or to diminish the population. Some of these predators might include keeping a big dog or cat in your yard, releasing non-venomous snakes and attracting predator birds like hawks or owls to your property. About Nutria - Nutria are semi-aquatic rodents that are technically considered an invasive species because they are not native to North America but they thrive in our ecosystems. Nutria were actually native to South America but were brought here by fur traders. Nutria are a medium-sized rodent that will grow over a foot long and weigh more than 20 pounds when they are full grown. They can also be identified by their three layered coat, long whiskers and red/orange teeth. They are semi-aquatic rodent that live and eat near water sources, but they can also live and eat on the land. Nutria are strict vegetarians and will eat a diet that consists of spike sawgrasses, cattails and reeds, but will also eat sugary plants like wheat, sugarcane, alfalfa, rice and corn. Nutria is a semi-aquatic rodent which is quite large in size. It looks similar to beavers or muskrats with the difference being a slightly haired tail and a round head. It has webbed hind feet which aid it in swimming and a white patch on the muzzle. Nutrias are really strong in swimming and have the ability to stay submerged in water for more than five minutes at a time. In comparison to the body, their forelegs are exceptionally small. There is a lining that prevents the entry of water in their mouths while they swim. Nutrias weigh an average of 12 pounds and can grow from 16 inches to 24 inches in length. Nutrias eat a number of small meals throughout the day and like consuming roots, tubers and rhizomes. Occasionally, they also consume freshwater mussels and crustaceans. They usually eat during semi-dark times of the day such as dusk or dawn. Nutrias consume approximately 25 percent of their weight daily. 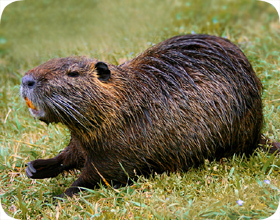 Nutria breeds around the year and are abundant in existence. In a year, adult nutria can give birth twice and be pregnant for the third time. They can give birth to as many as 13 offspring at a time. The baby nutrias have a coat of fur at the time of birth and their eyes are open. Newborn nutrias feed on vegetation within hours and are taken care of by adults for about seven to eight weeks. They are known to live for eight to 10 years. Nutrias are found in marshes, both freshwater as well as salt water. They are also found at bayous, rivers, drainage, ditches, canals, ponds, swamps and other types of wetlands. They make their burrows or nests close to the sources of water. They prefer living in large colonies and are quite social in nature. Nutrias are native to South America but have slowly spread to other parts of the world as well in last few decades. Nutrias could be infected with several pathogens and parasites. These can easily move or transmit to humans, pets and livestock. Parasites such as nematodes and blood flukes reside on nutrias and can cause “swimmer’s-itch” or “nutria-itch”. The symptoms include burning or itching of the skin and development of red pimples. Also, since this is caused because of contaminated water, the problem increases every time you use the same source for a bath or swim. Nutrias cause a lot of economic damage by disrupting catfish farming and damaging rice and sugar fields. They also interrupt in flood control. Their burrowing can result in a lot of damage. Nutrias dig into the soil to eat the basal and root portions of wetland plants. The roots of marsh vegetation bind the soft organic marsh soils together. When this root dies, the soils become vulnerable to erosion, which results in added sedimentation, instability of stream banks and reduced water quality. The burrows made by them can also hamper flood control as they weaken the foundations of reservoir dams and roadbeds. The burrows made under the base of buildings can damage the entire structure. They also erode the banks of streams, ditches and lakes and cause a lot of damage to other crops including corn, sugar, table beets, wheat, alfalfa, barley, oats, various melons, peanuts and a variety of vegetables. This results in economic loss to farmers. Nutria feed on wetland plants and invertebrates. For the same reason they compete with native species of the area such as muskrats. This results in loss of vegetation and wildlife habitat. Loss of native plants often leads to invasion of non-native species such as reed canary grass, which offers little habitat value for wildlife.